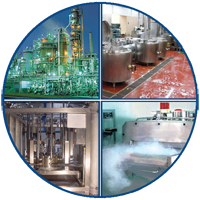 For lubrication and cleaning in the food, feed- and pharmaceutical industry special NSF-certified products are required. Our products all are NSF-certified. With brands like Rivolta and ProPart Indupa provides a versatile range of NSF-certified cleaning products for the food industry.